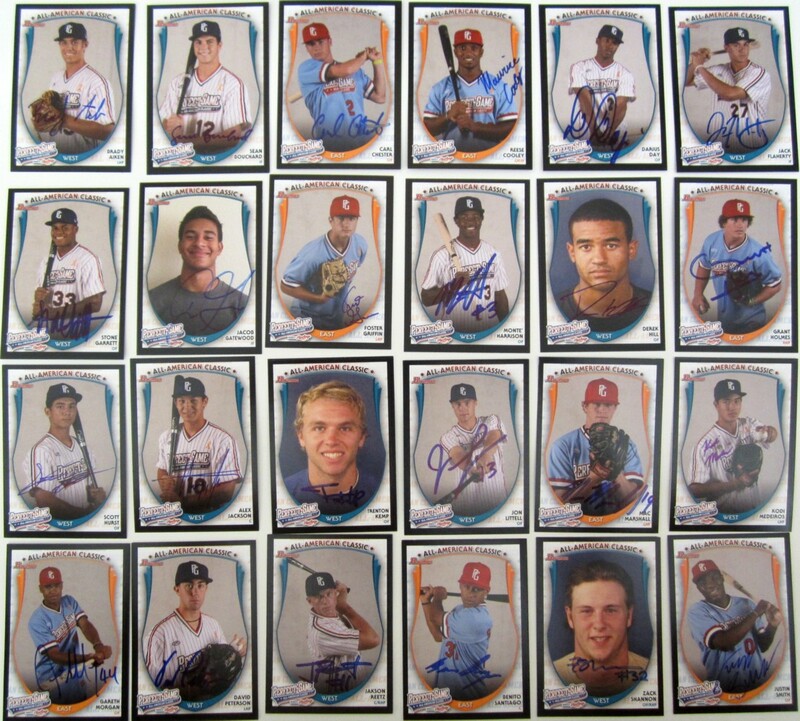 Partial set of 24 different Topps Bowman Rookie Cards distributed exclusively in very limited quantities at the 2013 Perfect Game (formerly AFLAC) All American High School Baseball Game played at Petco Park in San Diego AUTOGRAPHED in blue marker by the player. All 24 autographs were obtained in person. With certificate of authenticity from AutographsForSale.com. All 24 cards grade at least NrMt, with most NrMt-Mt or better and at least a few MINT. However, I cannot guarantee any specific grades from any specific grading companies. 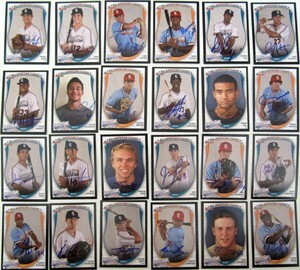 This autographed partial set includes top prospects Brady Aiken (#1 overall pick of the Houston Astros), Jacob Gatewood (#41 overall pick of the Milwaukee Brewers), Derek Hill (#23 overall pick of the Detroit Tigers), Grant Holmes (#22 overall pick of the Los Angeles Dodgers), Alex Jackson (#6 overall pick of the Seattle Mariners) and Kodi Medeiros (#12 overall pick of the Milwaukee Brewers); plus Sean Bouchard, Carl Chester, Reese Cooley, Darius Day, Jack Flaherty, Stone Garrett, Foster Griffin, Monte Harrison, Scott Hurst, Trenton Kemp, Jon Littell, Mac Marshall, Gareth Morgan, David Peterson, Jakson Reetz, Benito Santiago, Zack Shannon and Justin Smith. ONLY ONE SET AVAILABLE FOR SALE.